The Mitrovica Rock School organizes weekly workshops at both branches where members get to work with other teachers and connect over more challenging material than during their regular lessons. Below is a report on three of our September 2018 workshops, by PR trainee Tringa. Vocal coach Blerta held a songwriting workshop with student Nemanja B. Nemanja came prepared with some ideas to start a new song and wanted to work with Blerta on composition instead of his regular classes, where they work on vocal techniques, diaphragm exercises etc. Blerta prefers to start with the chord progression when making new songs. From their they continued with the vocal line and the lyrics. She asked Nemanja about the song’s topic and helped him complete his lyrics, mixing the words. From there, they built up the song: the verse, the chorus, the bridge. At the end of the workshop, the basic song had been written out and recorded for Nemanja’s band to arrange and learn. This was the message from the workshop with bass teacher Nemanja M. with student Veton. Nemanja and Veton worked on techniques suitable for funky music, particularly muted tones, ghost notes, and details on fast playing on the right hand. Veton doubted in his ability to play a funky song that he really liked, but after 45 minutes of practice, by trying different approaches, he succeeded and was very happy with his achievement. In the next workshop they worked on a heavy metal song, by focusing on typical chord progressions for that genre. 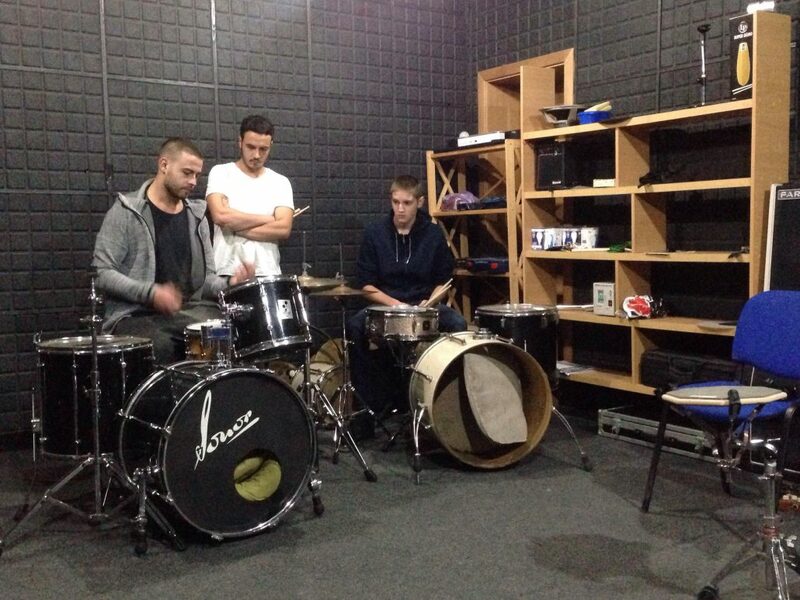 Drum teacher Filip M. held the workshop with students Dardan and Milos. They started with practicing basic simple beats in a very slow tempo using the metronome. The next thing was dynamic and accents while playing triplet beats. After that, Filip talked about different music genres and explained the differences between them.